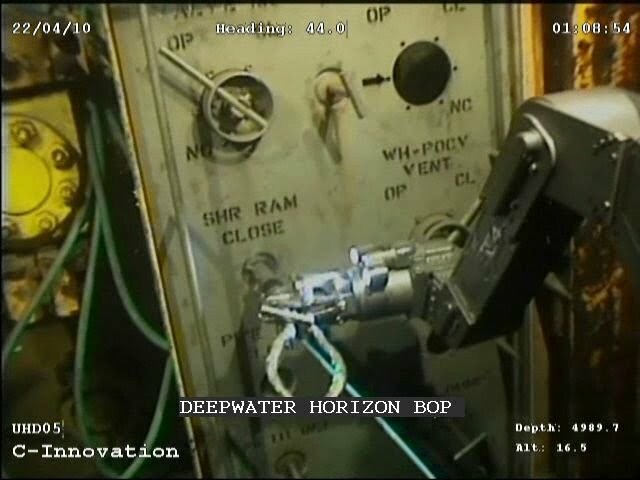 CBS 60 Minutes: the "Lone Wolf Problem"
The "BP Deepwater Horizon Spillcam mudsplosion": Here it is! The article reports that the House Senate Committee on Energy Independence and Global Warming requested that BP make its live, “reality show” continuous image of the spillcam (from the Macondo Blowout), so that everyone learn the scope of the problem. 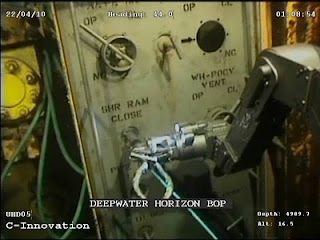 Wikipedia attribution link for a A robotic arm of a Remotely Operated Vehicle (ROV) attempts to activate the Deepwater Horizon Blowout Preventor (BOP). PBS: "The Storm that Drowned a City" and "the Hurricane of 38"
Some PBS stations (WETA 26 in Washington) aired the 2005 NOVA program “The Storm that Drowned a City”, giving an almost Biblical chronicle of Hurricane Katrina’s flooding of New Orleans. The link is (web url) here. Many residents in the downtown area north of the French Quarter went to bed Monday night thinking they are safe, and woke up in the middle of the night as the Love and 17th St Canals broke, admitting five feet of water. The documentary shows the hundreds of people stranded, as in the Superdome where Oprah would visit. The film shows how the levees were undermined from beneath, as the pilings for the levees were not dug deep enough. 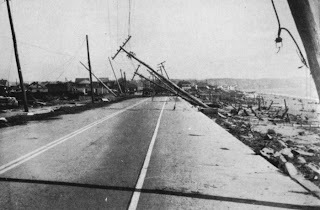 Then MPT (Annapolis) aired “The Hurricane of ‘38”, link here, from the "American Experience" series "The 30's". The black-and-white documentary shows how residents of Providence RI were oblivious to the approaching storm in September 1938, concerned mainly about the Depression. The sky turned yellow before the storm came, according to one elderly (now) observer, who said that it made her feel like the only living thing in the world, as the birds grew quiet. The film covers the effect on New York City (65 mph winds), and eastern Long Island, where (in the wealthy communities) it was much worse. With telephone lines down, communications were very poor. The hurricane did a lot of damage even inland in New England, which was shocked that a hurricane of this size could go so far north. The Weather Bureau denied responsibility for the 700 deaths. Wikipedia attribution link for NOAA picture of Rhode Island damage. I last visited the area myself in January 2003. Anderson Cooper and British correspondent Nic Robertson ran the one hour documentary “American Al Qaeda” on Saturday, May 15. CNN does not seem to have a stable link for the program, but Mediabistro has a synopsis here. The film traces the biography of Bryan Neal Vinas, on Long Island New York, after his parents broke up. As a result of emotional turmoil, he migrated from Catholicism to evangelical Christianity eventually to radical Islam and journey for training in Pakistan. Brian withdrew into a closed circle of friends and became persuaded by radical ideology on the Internet. He finally wanted to go to a madrassah. But in time he would be arrested and brought back to the US for trial. He would give authorities information about Al Qaeda plots against the Brussels, Belgium subway and then against the Long Island Rail Road. Security on the LIRR would be stepped up in late 2008. Authorities see his arrest as a real break, effectively giving them information like that gathered by a mole in an Alfred Hitchcock spy movie. There was no video from the AC360 show yet covering this episiode, but I found an unrelated one (lined from the AC360 site) about the dangers of flesh-eating bacteria during pregnancy that is so startling it’s worth pointing out somewhere, maybe as a “public health” advisory. 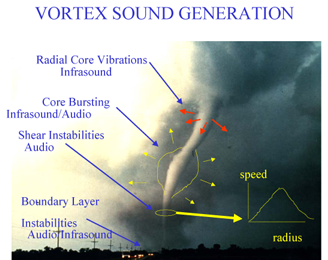 On Tuesday May 11 PBS Nova presented “The Hunt for the Supertwister” and depicted the work of modern tornado chasers, as well as presenting simulations (in pixar-like animation) and computer simulations of how supercell thunderstorms form tornadoes. The link for the film is here. The film shows several outbreaks in the Texas Panhandle, Oklahoma, and South Dakota. An interesting middle-section episode of the documentary concerns the long-track supertwister that struck La Plata, MD in April 2002, on the East Coast, outside of Torndao Alley. The film speculates on what might have happened had the storm tracked further west and gone through Washington DC. But in the DC area, the violent storms tend to track across southern Maryland, with flat land and a lot of water. Sometimes there are pockets of violent weather just east of the Catoctins around Frederick. The configuration of the Blue Ridge seems to affect the track of the most violent storms in the DC area, but sometimes violent storms form when moist southeast winds are blocked by the Blue Ridge and bounce back as a cold front approaches. I witnessed a small tornado along Route 9 near Rehoboth Beach driving back (it didn’t hit anything), one month before 9/11, in August 2001. The deep South (Mississippi and Alabama) seems as susceptible to tornadoes as the Great Plains. On Sunday Night, May 9, CBS "60 News" featured a 20 minute report by Steve Kroft, “Uncovering the Roots of Homegrown Terrorism”, about lone-wolfs who grow up in the west and become attracted to jihadist ideology. (A variation is other lone wolfs like Timothy McVeigh who get attracted to extreme Right Wing or neo-Nazi ideology.) New York City police commissioner Raymond Kelly contributed to the report. The concern is that someone like Faisal Shahzad is almost undetectable before the fact. Something goes wrong in the person’s life, and the person is attracted to absolutist ideology, and willing to throw away the entire rest of his life (as Richard Clarke told NBC this morning) to “make a point”. The person believes that letters to the editor or blog postings will not attract attention, but violent acts will. Ironically, the person may have been recruited partly by jihadist websites, now often available in English. All of this sounds like a curious observation in view of all other discussion in recent years about “free entry” to the Internet and how the Internet (both social media and conventional blogs) have “democratized” public policy debate. The White House said on Sunday that the Pakistani Taliban was behind the Incident in New York City May 1. It seems that the greatest problem comes from people acting alone or in very small groups that contact Al Qaeda cells or other groups overseas. So far these small groups have not gotten access to WMD technology. Discovery Channel offers Stephen Hawking "extraterrestrial videos" with a sober warning; tonight: "Into the Universe"; "How the Universe Works"
Recently Larry King Live broadcast a discussion with professor Stephen Hawking on the possibility that aliens could have detected our radio signals – including “I Love Lucy” shows – since they’ve now had about 70 years to do so. It’s conceivable that if there is an advanced civilization within 35 light years, it could be on its way. And it might not treat us better than we treat native populations. So some sobriety is indicated in contemplating the possibility of alien abduction. But Discovery tonight did broadcast a one hour “How the Universe Works” with a program about black holes, similar to that of the History Channel’s Universe series. Some of the footage seemed to be the same. But the documentary proposed that every super black hole (as at the center of the Milky Way) could have a White Hole on the other end that creates a new universe, leading to infinitely but countably many universes. They could have different forces or constants (a weakless universe, without the weak force, would not have heavy radioactive elements but might still host life). The documentary explained how black holes can emit gas streams that generate whole galaxies, called quasars as they start. Discovery continued with Hawking’s “Into the Universe” for two hours. Early on, they covered a type of super nova that could generate a gamma ray burst, and suggested that life on Earth was severely impacted 450 million years ago by such a burst. There is one star about 1000 light years away that could conceivably generate such a burst again. The second hour covered a “Man in Space” forecast (very much like the “Understanding” convention from 1978 (check the posthumous website for Dan Fry) ). The nearest known “Earth 2” is about 20 light years away, and that would take 300000 years to reach today. But presumably we will develop Diaspora-like spaceships capable of approaching life speeds. But still, we could not ethically send whole generations abroad, some of whom might have whole generations living on the ships, without resolving our whole “culture war” debate – consider the “natural family” debate that I’ve covered on other blogs. A society that built such a flotilla could not recover the economic investment within current lifetimes. But technology that increases longevity, as with gene therapy or even new kinds of radiation-resistant skin, comes into the debate as to how to make interstellar colonization possible, as well as discussions on how much procreation would occur. Discovery does have Stephen Hawking’s material on aliens on its website here, with seven short videos, showing possible squid-like beings in the undersea area of Europa, grazing and hunting animals on other worlds, and gas-bag life in the atmosphere of Jupiter. On earth, the box jellyfish might be something like alien life. Picture: could an earth-like alien hang-out at a gay disco?